As discussed previously, our Facebook page is working well for us so we've been giving some thought to how we can better utilise Facebook to market our business. Companies like Zynga are having a lot of success with their Facebook games like Farmville, Mafia Wars, Poker and their latest game Cafe World. That got us thinking about how we might be able to leverage Facebook and computer game psychology for Shoes of Prey. I started playing Cafe World on Facebook the other day and here's why I think it's so addictive and already has over 30million monthly active users after only launching 3 months ago! The game is relatively easy to learn and follow. It's got a look and feel quite similar to The Sims. There are levels which are quick and easy to move up. When you reach a new level you're rewarded with new elements in the game being unlocked, like new items you can cook, or new furniture to buy. Cooking dishes for your cafe can take anywhere from 3 minutes to 2 days, so you can happily sit on the game for 20 minutes cooking small dishes and then you're encouraged to come back each day to serve up your larger dishes which take longer to cook. Often when you reload the game you'll be given some kind of gift or reward, like a dish that's already cooked for you to serve. This encourages you to re-open the game a couple of times each day. When you open your cafe you're prompted to 'Announce the grand opening' which posts a story to your news feed. Each time you reach a new level you're prompted to announce it to your friends. You're rewarded in the game for adding neighbors. Neighbors are Facebook friends who also have cafes. If your friends aren't playing Cafe World you're prompted to invite them. When you hire a waiter you select one of your Facebook friends to hire. When doing this you're prompted to send them a message letting them know you've hired them in Cafe World. You can give in game gifts as bonuses to your Cafe World neighbours which act as reminders to your friends to come back and load the game up to use the gift you've sent them. 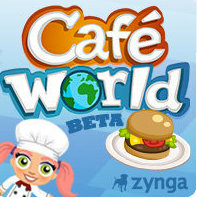 Clearly Zynga have taken every opportunity in the game to encourage you to tell your friends about Cafe World, and judging by the number of Farmville posts appearing in my news feed they do the same in their other games. When you think about it, it's impressive that computer game makers can have us so enthralled with something that doesn't have any real world presence. So surely we can create a Facebook application that's even more entertaining given it can link into designing your own shoes in the real world? This thought is still very much in it's infancy so if you have any ideas we'd love to hear them! If you are programming an actual game, why not use the same Zynga formula to create an addictive "Boutique World" game? The players can design their own shoes using your Shoe of Prey web interface. Their custom-designed shoes will then appear in their virtual boutique to share with their friends. Then, maybe you can have some sort of referral / commission scheme where the retailers get rewarded with a discount for every real world purchase? I agree with the boutique idea, I'd probably go for a shoe boutique though with all of my designs being "available" in the store and "displayed"
I think the idea is great mate ... Why not?! It's just about the execution - the leverage of social media is incredible. Its just a question of whether facebook becomes a place for business or a place for people to to have "me time" and connect with their friends (ie a bit like personal email, personal mobiles etc) . I think it's becoming more business orientated - so maybe an app could be the way to go. I certainly think you will have a monopoly! Daniel and Miss Polka - love it! That's a brilliant idea! Designing your own shoes for your online shoe boutique would be heaps of fun and it's such a brilliant brand tie in too. Then adding in-game affiliate marketing and the ability for you and your friends to actually buy the shoes - that's gold. Chris, good thought, it definitely needs to be executed properly and it will take some time to do that, but if CafeWorld can get to 30million users in 3 months there's definitely good potential there! I'm a game geek, yet I've never understood the appeal of the Facebook games. On the other hand, I'm nearly 30 years old and still believe in the tooth fairy, so my opinion probably shouldn't account for much. No probs. Happy to help...! I have found your posts of your business journey very useful. In fact, I have found Google Sketchup especially useful for my own business. Thanks to your post for highlighting that app for me..! So, I'm giving some back... Karmic forces GO! The Revolutionary - I was with you, I'm a game geek too (the Civilization series has taken countless hour form my life!) and thought Facebook games were a bit silly, but Cafe World has me hooked. It's similar in a lot of ways to some of my old favourties Pizza Tycoon and Transport Tycoon plus it has social features built in. While I'm still going to keep playing Civilization 4 for a while I can see the appeal these games have for people. "When you think about it, it's impressive that computer game makers can have us so enthralled with something that doesn't have any real world presence." I guess the psychology beyond this fad on online games is that many people are not satisfied with the reality of life, that we tend to create a utopia or a perfect world that only games could give.